Is is possible to create a data literacy scale modelled on the GDS digital literacy scale? I think it might be, and this blog post details how I think it would work. 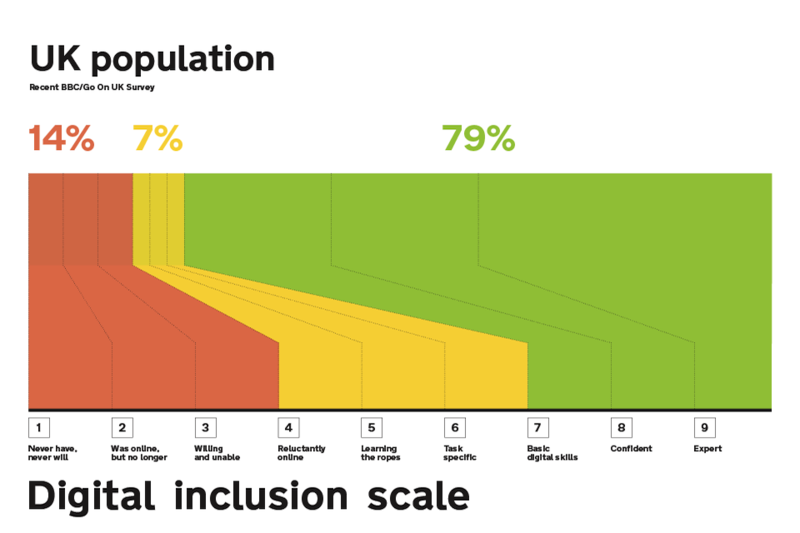 The digital literacy scale was developed by GDS and published as part of the Government Digital Inclusion Strategy in 2014. I found it useful when working with a wide range of government services. It was a good check to see where the gaps in user research existed, and it was a useful tool to use with recruitment agencies. As a member of service standard assessment panels, it was also helpful to use to ask service managers where they thought the users of their service were on the scale, and why. A data literacy scale would also allow teams to identify gaps in testing and categorise findings from research more easily. I’ve spoken to as many people as I can both inside and outside of ONS and I’ve produced a version of what this might look like. the reason for using the data in the first place (e.g. policy development). I’ll be honest: the spheres listed above are not all areas where I’d claim expertise and I’m not sure that this version is complete enough to use. The problem is that this draft has sat around for six months without me finding any ways of developing it further or anything additional to add to it. In the spirit of working in the open, I’m publishing it for comment in the knowledge that it’s incomplete. are there any important indicators of data literacy that you feel are missing from the draft? would you use this scale in your work? are there any aspects that would make it more usable for you? You can let me know what you think by commenting on this blog post, commenting on the google sheet embedded above, or by email at matt.knight@ons.gov.uk or Twitter @mattinwales. In return, I promise to publish any findings on this blog. Great idea. I like the fact that you have included issues related to disclosive information. We have been thinking about what might go into a mandatory information and data literacy course for our organisation – a bit like mandatory information governance – and this looks like a good place to start. Think this is very good too and really defines the types of user very well. Far more detail than the data engagement scale that was proposed late last year. One little point i noticed was the title of “makers” for that more experienced day to day user group. Is there a reason for this title that i am missing? I was thinking if splitting explorers out from the readers and renaming this “makers” group explorers or maybe managers would be more appropriate. But thanks ever so much for sharing this. Thanks for the feedback and it’s a good point that “makers” may be slightly too narrow a descriptor for that stage. I’ve got a few conversations to have with some others who contacted me after the original blog post so I hope to post some thoughts or another version of this at some stage.